Abstract: Coat proteins (CPs) are the most abundant protein produced during a viral infection. CPs have been shown to regulate the infection processes of RNA viruses, including RNA replication and gene expression. The numerous activities of the CP in infection are likely to require regulation, possibly through posttranslational modifications. Protein posttranslational modifications are involved in signal transduction, expanding and regulating protein function, and responding to changes in the environment. Accumulating evidence suggests that phosphorylation of viral CPs is involved in the regulation of the viral infection process from enabling virion disassembly to regulation of viral protein synthesis and replication. CP phosphorylation also affects viral trafficking and virion assembly. This review focuses on the regulatory roles that phosphorylation of CPs has in the life cycle of viruses with RNA genomes. Viral molecules must be able to sense and adapt to the environment. Mechanistically, this can be done by ligand recognition, protein conformational changes, or posttranslational modifications (PTMs).1–5 PTMs are especially important in the molecular communication across cellular processes, including signal transduction and the host response to viral infection.6–13 Viruses must utilize this form of cellular communication for their own nefarious purposes. A well-understood form of PTM is the phosphorylation of specific amino acids in proteins. In 1954, casein was the first protein observed to be phosphorylated.14 Protein phosphorylation has since been shown to alter protein structure and function in response to changes in the cellular environment.15,16 Accumulating evidence suggests that all parts of the viral life cycle are regulated by phosphorylation. Phosphorylation of viral nonstructural proteins and the effects on viral infection have been reviewed previously.17,18 This review focuses on the phosphorylation of viral coat protein(s) (CPs) in the life cycles of single-stranded (ss) RNA viruses. This review is not a comprehensive examination of all regulatory functions of phosphorylation of CPs, but provides specific examples and themes. Viruses typically encode one or two CPs with several common structural features (Figure 1).23,24 Many CPs have highly flexible N- or C-terminal tails that contain positively charged residues that can interact with RNA. All viral CPs contain regions of higher order structure that form the shell-like domain around the encapsidated RNA in virions. Some viral CPs will contain a protruding domain following the shell domain that can form oligomeric structures and bind receptors.25–27 Importantly, the CPs can associate with each other to form higher order structures similar to Lego blocks, which can expand the functions of the CPs by increasing the surface for interaction with cellular and viral molecules. Figure 1 Examples of the structures of viral coat proteins and the features involved in RNA binding and formation of capsid oligomers. Several plant RNA viruses use phosphorylation to regulate CP–RNA interactions and structure. 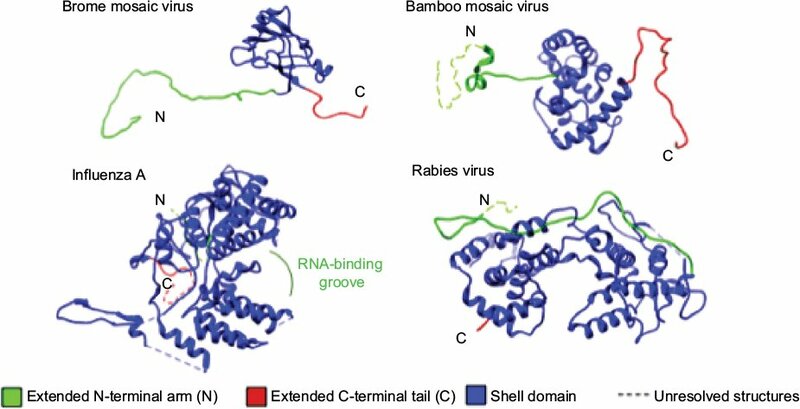 Bamboo mosaic virus (BaMV) is a (+)-strand ssRNA virus and a member of the family Alphaflexiviridae. The BaMV CP can be phosphorylated in the C-terminal tail.32–35 Mutations in the BaMV CP that prevented phosphorylation increased CP binding to the BaMV RNA, while replacement with glutamate, an amino acid that acts as a phosphomimetic, decreased CP interaction with RNA.34 Weakened CP–RNA interaction was speculated to facilitate the release of RNA from the capsid. The BaMV CP is phosphorylated in plants by casein kinase 2 (CK2) of Nicotiana benthamiana.34 CK2-alpha and the BaMV CP colocalized to the plasmodesmata that connect plant cells, suggesting that CP phosphorylation regulates cell-to-cell movement, possibly by facilitating the release of RNA from the ribonucleoprotein (RNP) complex after its passage through the plasmodesmata into a neighboring cell. Brome mosaic virus (BMV), a member of the family Bromoviridae that has a multipartite, (+)-strand, RNA genome, uses the CP to regulate replication and translation of the BMV genome. The CP does so through binding to regulatory motifs in the BMV RNA.39 We had recently reported our findings that the BMV CP was heavily phosphorylated at the serine and threonine residues on the N-terminal arm that interacts with RNA.5 Phosphorylation affected RNA accessibility in the virion and was able to alter CP binding to the encapsidated RNAs. Interestingly, BMV consists of three independent viral particles, each of which contains 180 subunits of the CP, and CP phosphorylation has a dramatic effect only on a subset of the particles. In the affected particles, the packing of the encapsidated RNAs is reorganized as a function of CP phosphorylation. This likely regulates the timing of BMV RNA release in the cell and the timing of BMV protein synthesis.40 Notably, RNA sequences found to bind the CP include regulatory motifs in the RNAs that affect BMV translation and replication. Replacement of a threonine in the flexible N-terminal arm of the BMV CP with a phosphomimetic glutamate altered the ratios of encapsidated RNA, affected the kinetics of replication, and decreased the time needed for translation of the BMV CP. These results suggest that the degree of CP phosphorylation can regulate processes critical to BMV infection. An intriguing possibility is that these interactions may occur within the virion before the start of the infection process. Beet black scorch virus (BBSV) is a (+)-strand ssRNA virus of the family Tombusviridae. The stability of the virions is essential for systemic infection of N. benthamiana.41 The BBSV CP was phosphorylated at four residues, one of which, T41, was located in a loop of a hinge structure that connected the flexible sequence and the structured domain.42,43 The hinge is C-terminal to the RNA-binding domain, and phosphorylation of T41 is not expected to directly affect RNA binding. Mutations to T41 prevented replication and gene expression, resulting in the formation of small, irregularly shaped virions that are unstable and defective in encapsidating viral RNA, and abolished viral systemic movement in N. benthamiana.43 This suggests that T41 phosphorylation may impact the secondary and tertiary precapsid changes that occur during virus particle morphogenesis. Protein kinase A was shown to phosphorylate the BBSV CP. Further studies are underway to determine if T41 phosphorylation/dephosphorylation cycles provide molecular switches for virion assembly, by examining the viral assembly intermediates. Rubella virus (RuV) is an enveloped (+)-strand ssRNA virus and a member of the family Togaviridae. The RuV CP is involved in RNA packaging, a regulated event that occurs on the Golgi complex membrane. It interacts with multiple host cell proteins and appears to be proapoptoic in several cell lines.50–53 The RuV CP was phosphorylated at multiple residues, with the major site at S46 in the RNA-binding domain.54–58 Hypophosphorylated mutants at S46 bind RNA more efficiently than the CPs retaining wild type levels of phosphorylation. The protein phosphatase PP1A is known to dephosphorylate RuV in vitro,58 but the kinase(s) responsible for RuV CP phosphorylation remains to be identified. West Nile virus (WNV) is an enveloped (+)-strand RNA virus and a member of the family Flaviviridae. In addition to its role in RNA encapsidation, the WNV CP interacts with host proteins, including importin-alpha, and is involved in initiating apoptosis.59,60 The WNV CP is involved in initiating apoptosis through activation of caspases and disruption of mitochondrial functions.60 The CP has been shown to enter the cell nucleus by interacting with importin-alpha through a nuclear localization sequence.59 The initiation of apoptosis was revealed to be due to the sequestration of HDM2 by the CP into the nucleolus, inducing p53-mediated apoptosis.61 The WNV CP is phosphorylated by PKC at the carboxy termini.62 The presence of a PKC inhibitor decreased the association of CP with importin-alpha, resulting in increased accumulation of the CP in the cytoplasm. Nuclear localization sequence-dependent nuclear import has been shown to be regulated by phosphorylation.63–66 Phosphorylation of WNV CP enhances its binding to HDM2.62 This stabilizes the p53 protein by preventing HDM2–p53 complex formation, causing accumulation of p53 and its downstream target protein Bax, and initiating apoptotic events. The recombinant WNV CP does not bind to RNA unless the phosphates in the CP have been removed.67 Phosphorylation could prevent premature encapsidation of the RNA. Since the virus assembly occurs in the cytoplasm, dephosphorylation of the CP reduces interactions with importin-alpha to increase cytoplasmic localization of the CP and the virion assembly. This is consistent with the observation of the CP trafficking from the nucleus to the cytoplasm late in infection, and a relative reduction in CP phosphorylation. Furthermore, phosphorylation of the CP modulates the rate of oligomerization, with higher-order oligomers forming more rapidly with hypophosphorylated mutants than with the wild-type CP. Rabies virus (RV) is a (−)-strand ssRNA enveloped virus and a member of the family Rhabdoviridae. The NP of (−)-strand RNA viruses regulates the transition from viral RNA transcription to replication,81 and the RV NP is no exception. The RV NP is phosphorylated proximal to the putative RNA-binding domain in the C-terminal region of the NP.82,83 The unphosphorylated form of the NP encapsidated RNA more efficiently.84 Cellular kinases and phosphatase(s) responsible for the phosphorylation of RV remain to be identified. Influenza A virus is an enveloped (−)-strand ssRNA virus and a member of the family Orthomyoxoviridae. The influenza A NP is a component of the RNP complex and its oligomerization is required for the transcription and replication of full-length RNA genome segments,98–101 but it needs to remain in a monomeric state before the assembly of the RNP complex.102,103 The NP was phosphorylated at multiple sites, and reversible phosphorylation of S165, located in the “groove” of the NP which interacts with the “tail loop” of another NP, meditates NP oligomerization.100,104 Substitution of S165 to phosphomimetics resulted in primarily monomeric NP, while a change to an alanine resulted in oligomers of the NP.98,102,105 Viral infection was significantly reduced with alanine and aspartate substitutions, while substitution with glutamate failed to generate infectious virus.105 RNP complexes made with mutant NP had decreased accumulation of viral mRNAs. Identifying phosphorylated proteins remains a challenge due to the stoichiometric and labile nature of phosphorylation, but substantial contributions have shown that phosphorylation of CP from RNA viruses has an important impact on viral infection from entry to viral gene expression to virion assembly. Phosphorylation of the CP plays a significant role by modulating CP–RNA interaction, the structure and stability of viral particles, and the intracellular locations of viral molecules. Protein kinases regulate essentially every cellular process and often respond to the conditions in the cell. Therefore, it makes sense that viruses will borrow or steal these enzymes for their own purposes. Protein phosphatases are also involved in signal transduction.10–13 Phosphatases such as Shp1 and Shp2 regulate DNA virus infection as well as signal transduction pathways that can affect innate immune responses.106–108 It is likely that they are also involved in RNA virus infection. It is highly likely that cellular kinases and phosphatases will act on viral CPs as a way to prevent the viral infection process. With adeno-associated virus, phosphorylation led to degradation of the capsids.109 Furthermore, kinase and phosphatase activities will change with environmental input experienced by the host cell. Thus, they will affect viral infection as a function of the environment. Although this review focuses on phosphorylation of the CP in RNA viruses, other PTMs are likely to play a role in the viral infection process. Further evaluation of the role of CP phosphorylation, including identification of kinases and phosphatases, could lead to potential therapeutics. We thank L Kao for editing this manuscript. HH acknowledges support from the Floyd Plant Biology Fellowship. HH and CK contributed toward data analysis, drafting and revising the paper and agree to be accountable for all aspects of the work. Wang J. Protein recognition by cell surface receptors: physiological receptors versus virus interactions. Trends Biochem Sci. 2002;27(3):122–126. Schievano E, Calisti T, Menegazzo I, et al. pH-Dependent conformational changes and topology of a herpesvirus translocating peptide in a membrane-mimetic environment. Biochemistry. 2004;43(29):9343–9351. Gruenke JA, Armstrong RT, Newcomb WW, Brown JC, White JM. New insights into the spring-loaded conformational change of influenza virus hemagglutinin. J Virol. 2002;76(9):4456–4466. Matsuyama S, Taguchi F. Receptor-induced conformational changes of murine coronavirus spike protein. J Virol. 2002;76(23):11819–11826. Hoover HS, Wang JC, Middleton S, Ni P, Zlotnick A, Vaughan RC, Kao CC. Phosphorylation of the brome mosaic virus capsid regulates the timing of viral infection. J Virol. 2016;90(17):7748–7760. Hazelbauer GL, Lai WC. Bacterial chemoreceptors: providing enhanced features to two-component signaling. Curr Opin Microbiol. 2010;13(2):124–132. Casino P, Rubio V, Marina A. Structural insight into partner specificity and phosphoryl transfer in two-component signal transduction. Cell. 2009;139(2):325–336. Gao R, Stock AM. Molecular strategies for phosphorylation-mediated regulation of response regulator activity. Curr Opin Microbiol. 2010;13(2):160–167. Stewart RC. Protein histidine kinases: assembly of active sites and their regulation in signaling pathways. Curr Opin Microbiol. 2010;13(2):133–141. Graves JD, Krebs EG. Protein phosphorylation and signal transduction. Pharmacol Ther. 1999;82(2–3):111–121. Davidson G, Wu W, Shen J, et al. Casein kinase 1 gamma couples Wnt receptor activation to cytoplasmic signal transduction. Nature. 2005;438(7069):867–872. Gray P, Dunne A, Brikos C, Jefferies CA, Doyle SL, O’Neill LA. MyD88 adapter-like (Mal) is phosphorylated by Bruton’s tyrosine kinase during TLR2 and TLR4 signal transduction. J Biol Chem. 2006;281(15):10489–10495. Weston CR, Davis RJ. The JNK signal transduction pathway. Curr Opin Cell Biol. 2007;19(2):142–149. Burnett G, Kennedy EP. The enzymatic phosphorylation of proteins. J Biol Chem. 1954;211(2):969–980. Canova MJ, Molle V. Bacterial serine/threonine protein kinases in host-pathogen interactions. J Biol Chem. 2014;289(14):9473–9479. Yang C, Zhang C, Dittman JD, Whitham SA. Differential requirement of ribosomal protein S6 by viruses with different translational initiation strategies. Virology. 2009;390:163–173. Lenard J. Host cell protein kinases in nonsegmented negative-strand virus (mononegavirales) infection. Pharmacol Ther. 1999;83(1):39–48. Jakubiec A, Jupin I. Regulation of positive-strand RNA virus replication: the emerging role of phosphorylation. Virus Res. 2007;129(2):73–79. Murphy FA, Fauquet CM, Bishop DHL, et al. Virus Taxonomy: Classification and Nomenclature of Viruses. Wien :Springer-Verlag. 1995.
van Regenmortel MJHV, Fauquet CM, Bishop DHL, et al. The Seventh Report of the International Commitee on Taxonomy of Viruses. SanDiego, CA: Academic Press; 2000. Howard CR, Fletcher NF. Emerging virus diseases: can we ever expect the unexpected? Emerg Microbes Infect. 2012;1(12):e46. Woolhouse ME, Gowtage-Sequeria S. Host range and emerging and reemerging pathogens. Emerg Infect Dis. 2005;11(12):1842–1847. Ni P, Cheng Kao C. Non-encapsidation activities of the capsid proteins of positive-strand RNA viruses. Virology. 2013;446(1–2):123–132. Rossmann MG, Johnson JE. Icosahedral RNA virus structure. Annu Rev Biochem. 1989;58:533–573. Bertolotti-Ciarlet A, White LJ, Chen R, Prasad BV, Estes MK. Structural requirements for the assembly of Norwalk virus-like particles. J Virol. 2002;76(8):4044–4055. Kakani K, Reade R, Katpally U, Smith T, Rochon D. Induction of particle polymorphism by cucumber necrosis virus coat protein mutants in vivo. J Virol. 2008;82(3):1547–1557. Prasad BV, Hardy ME, Dokland T, Bella J, Rossmann MG, Estes MK. X-ray crystallographic structure of the Norwalk virus capsid. Science. 1999;286(5438):287–290. Boyle WJ, Smeal T, Defize LH, Angel P, Woodgett JR, Karin M, Hunter T. Activation of protein kinase C decreases phosphorylation of c-Jun at sites that negatively regulate its DNA-binding activity. Cell. 1991;64(3):573–584. Mayrand SH, Dwen P, Pederson T. Serine/threonine phosphorylation regulates binding of C hnRNP proteins to pre-mRNA. Proc Natl Acad Sci U S A. 1993;90(16):7764–7768. Wright PE, Dyson HJ. Intrinsically disordered proteins in cellular signalling and regulation. Nat Rev Mol Cell Biol. 2015;16(1):18–29. Groban ES, Narayanan A, Jacobson MP. Conformational changes in protein loops and helices induced by post-translational phosphorylation. PLoS Comput Biol. 2006;2(4):e32. Lin NS, Lin FZ, Huang TY, Hsu YH. Genome properties of bamboo mosaic virus. Phytopathology. 1992;82:731–734. Yang CC, Liu JS, Lin CP, Lin NS. Nucleotide sequence and phylogenetic analysis of a bamboo mosaic potexvirus isolate from common bamboo (Bambusa vulgaris McClure). Bot Bull Acad Sin. 1997;38:77–84. Hung CJ, Huang YW, Liou MR, et al. Phosphorylation of coat protein by protein kinase CK2 regulates cell-to-cell movement of bamboo mosaic virus through modulating RNA binding. Mol Plant Microbe Interact. 2014;27(11):1211–1225. Lin NS, Lee YS, Lin BY, Lee CW, Hsu YH. The open reading frame of bamboo mosaic potexvirus satellite RNA is not essential for its replication and can be replaced with a bacterial gene. Proc Natl Acad Sci U S A. 1996;93(7):3138–3142. Revers F, Le Gall O, Candresse T, Maule AJ. New advances in understanding the molecular biology of plant/potyvirus interactions. Mol Plant Microbe Interact. 1999;12:367–376. Ivanov KI, Puustinen P, Merits A, Saarma M, Makinen K. Phosphorylation down-regulates the RNA binding function of the coat protein of potato virus A. J Biol Chem. 2001;276(17):13530–13540. Ivanov KI, Puustinen P, Gabrenaite R, et al. Phosphorylation of the potyvirus capsid protein by protein kinase CK2 and its relevance for virus infection. Plant Cell. 2003;15(9):2124–2139. Yi G, Vaughan RC, Yarbrough I, Dharmaiah S, Kao CC. RNA binding by the brome mosaic virus capsid protein and the regulation of viral RNA accumulation. J Mol Biol. 2009;391(2):314–326. Vaughan R, Tragesser B, Ni P, Ma X, Dragnea B, Kao CC. The tripartite virions of the brome mosaic virus have distinct physical properties that affect the timing of the infection process. J Virol. 2014;88(11):6483–6491. Zhang X, Zhao X, Zhang Y, et al. N-terminal basic amino acid residues of Beet black scorch virus capsid protein play a critical role in virion assembly and systemic movement. Virol J. 2013;10:200. Weiland JJ, Van Winkle D, Edwards MC, Larson RL, Shelver WL, Freeman TP, Liu HY. Characterization of a U.S. Isolate of beet black scorch virus. Phytopathology. 2007;97(10):1245–1254. Zhao X, Wang X, Dong K, et al. Phosphorylation of Beet black scorch virus coat protein by PKA is required for assembly and stability of virus particles. Sci Rep. 2015;5:11585. Atabekov JG, Rodionova NP, Karpova OV, Kozlovsky SV, Novikov VK, Arkhipenko MV. Translational activation of encapsidated potato virus X RNA by coat protein phosphorylation. Virology. 2001;286(2):466–474. Almazan F, Galan C, Enjuanes L. The nucleoprotein is required for efficient coronavirus genome replication. J Virol. 2004;78(22):12683–12688. Schelle B, Karl N, Ludewig B, Siddell SG, Thiel V. Selective replication of coronavirus genomes that express nucleocapsid protein. J Virol. 2005;79(11):6620–6630. Jayaram H, Fan H, Bowman BR, et al. X-ray structures of the N- and C-terminal domains of a coronavirus nucleocapsid protein: implications for nucleocapsid formation. J Virol. 2006;80(13):6612–6620. Chen H, Gill A, Dove BK, et al. Mass spectroscopic characterization of the coronavirus infectious bronchitis virus nucleoprotein and elucidation of the role of phosphorylation in RNA binding by using surface plasmon resonance. J Virol. 2005;79(2):1164–1179. Spencer KA, Dee M, Britton P, Hiscox JA. Role of phosphorylation clusters in the biology of the coronavirus infectious bronchitis virus nucleocapsid protein. Virology. 2008;370(2):373–381. Frey TK. Molecular biology of rubella virus. Adv Virus Res. 1994;44:69–160. Suomalainen M, Garoff H, Baron MD. The E2 signal sequence of rubella virus remains part of the capsid protein and confers membrane association in vitro. J Virol. 1990;64(11):5500–5509. Beatch MD, Hobman TC. Rubella virus capsid associates with host cell protein p32 and localizes to mitochondria. J Virol. 2000;74(12):5569–5576. Duncan R, Esmaili A, Law LM, Bertholet S, Hough C, Hobman TC, Nakhasi HL. Rubella virus capsid protein induces apoptosis in transfected RK13 cells. Virology. 2000;275(1):20–29. Liu Z, Yang D, Qiu Z, Lim KT, Chong P, Gillam S. Identification of domains in rubella virus genomic RNA and capsid protein necessary for specific interaction. J Virol. 1996;70(4):2184–2190. Garbutt M, Law LM, Chan H, Hobman TC. Role of rubella virus glycoprotein domains in assembly of virus-like particles. J Virol. 1999;73(5):3524–3533. Marr LD, Sanchez A, Frey TK. Efficient in vitro translation and processing of the rubella virus structural proteins in the presence of microsomes. Virology. 1991;180(1):400–405. Law LJ, Ilkow CS, Tzeng WP, Rawluk M, Stuart DT, Frey TK, Hobman TC. Analyses of phosphorylation events in the rubella virus capsid protein: role in early replication events. J Virol. 2006;80(14):6917–6925. Law LM, Everitt JC, Beatch MD, Holmes CF, Hobman TC. Phosphorylation of rubella virus capsid regulates its RNA binding activity and virus replication. J Virol. 2003;77(3):1764–1771. Bhuvanakantham R, Chong MK, Ng ML. Specific interaction of capsid protein and importin-alpha/beta influences West Nile virus production. Biochem Biophys Res Commun. 2009;389(1):63–69. Yang JS, Ramanathan MP, Muthumani K, et al. Induction of inflammation by West Nile virus capsid through the caspase-9 apoptotic pathway. Emerg Infect Dis. 2002;8(12):1379–1384. Yang MR, Lee SR, Oh W, et al. West Nile virus capsid protein induces p53-mediated apoptosis via the sequestration of HDM2 to the nucleolus. Cell Microbiol. 2008;10(1):165–176. Bhuvanakantham R, Cheong YK, Ng ML. West Nile virus capsid protein interaction with importin and HDM2 protein is regulated by protein kinase C-mediated phosphorylation. Microbes Infect. 2010;12(8–9):615–625. Nardozzi JD, Lott K, Cingolani G. Phosphorylation meets nuclear import: a review. Cell Commun Signal. 2010;8:32. Harreman MT, Kline TM, Milford HG, Harben MB, Hodel AE, Corbett AH. Regulation of nuclear import by phosphorylation adjacent to nuclear localization signals. J Biol Chem. 2004;279(20):20613–20621. Zhang F, White RL, Neufeld KL. Phosphorylation near nuclear localization signal regulates nuclear import of adenomatous polyposis coli protein. Proc Natl Acad Sci U S A. 2000;97(23):12577–12582. Teng AC, Al-Montashiri NA, Cheng BL, Lou P, Ozmizrak P, Chen HH, Stewart AF. Identification of a phosphorylation-dependent nuclear localization motif in interferon regulatory factor 2 binding protein 2. PLoS One. 2011;6(8):e24100. Cheong YK, Ng ML. Dephosphorylation of West Nile virus capsid protein enhances the processes of nucleocapsid assembly. Microbes Infect. 2011;13(1):76–84. Surjit M, Lal SK. The SARS-CoV nucleocapsid protein: a protein with multifarious activities. Infect Genet Evol. 2008;8(4):397–405. van Hemert MJ, van den Worm SH, Knoops K, Mommaas AM, Gorbalenya AE, Snijder EJ. SARS-coronavirus replication/transcription complexes are membrane-protected and need a host factor for activity in vitro. PLoS Pathog. 2008;4(5):e1000054. Li YH, Li J, Liu XE, Wang L, Li T, Zhou YH, Zhuang H. Detection of the nucleocapsid protein of severe acute respiratory syndrome coronavirus in serum: comparison with results of other viral markers. J Virol Methods. 2005;130(1–2):45–50. Li FQ, Xiao H, Tam JP, Liu DX. Sumoylation of the nucleocapsid protein of severe acute respiratory syndrome coronavirus. FEBS Lett. 2005;579(11):2387–2396. Surjit M, Kumar R, Mishra RN, Reddy MK, Chow VT, Lal SK. The severe acute respiratory syndrome coronavirus nucleocapsid protein is phosphorylated and localizes in the cytoplasm by 14-3-3-mediated translocation. J Virol. 2005;79(17):11476–11486. Spiegel M, Pichlmair A, Martinez-Sobrido L, Cros J, García-Sastre A, Haller O, Weber F. Inhibition of Beta interferon induction by severe acute respiratory syndrome coronavirus suggests a two-step model for activation of interferon regulatory factor 3. J Virol. 2005;79(4):2079–2086. Zheng B, He ML, Wong KL, et al. Potent inhibition of SARS-associated coronavirus (SCOV) infection and replication by type I interferons (IFN-alpha/beta) but not by type II interferon (IFN-gamma). J Interferon Cytokine Res. 2004;24(7):388–390. Kopecky-Bromberg SA, Martinez-Sobrido L, Frieman M, Baric RA, Palese P. Severe acute respiratory syndrome coronavirus open reading frame (ORF) 3b, ORF 6, and nucleocapsid proteins function as interferon antagonists. J Virol. 2007;81(2):548–557. Yan X, Hao Q, Mu Y, Timani KA, Ye L, Zhu Y, Wu J. Nucleocapsid protein of SARS-CoV activates the expression of cyclooxygenase-2 by binding directly to regulatory elements for nuclear factor-kappa B and CCAAT/enhancer binding protein. Int J Biochem Cell Biol. 2006;38(8):1417–1428. Zakhartchouk AN, Viswanathan S, Mahony JB, Gauldie J, Babiuk LA. Severe acute respiratory syndrome coronavirus nucleocapsid protein expressed by an adenovirus vector is phosphorylated and immunogenic in mice. J Gen Virol. 2005;86(Pt 1):211–215. Peng TY, Lee KR, Tarn WY. Phosphorylation of the arginine/serine dipeptide-rich motif of the severe acute respiratory syndrome coronavirus nucleocapsid protein modulates its multimerization, translation inhibitory activity and cellular localization. FEBS J. 2008;275(16):4152–4163. He R, Dobie F, Ballantine M, et al. Analysis of multimerization of the SARS coronavirus nucleocapsid protein. Biochem Biophys Res Commun. 2004;316(2):476–483. Wu CH, Yeh SH, Tsay YG, et al. Glycogen synthase kinase-3 regulates the phosphorylation of severe acute respiratory syndrome coronavirus nucleocapsid protein and viral replication. J Biol Chem. 2009;284(8):5229–5239. Yang J, Hooper DC, Wunner WH, Koprowski H, Dietzschold B, Fu ZF. The specificity of rabies virus RNA encapsidation by nucleoprotein. Virology. 1998;242(1):107–117. Albertini AA, Wernimont AK, Muziol T, et al. Crystal structure of the rabies virus nucleoprotein-RNA complex. Science. 2006;313(5785):360–363. Dietzschold B, Lafon M, Wang H, Otvos L Jr, Celis E, Wunner WH, Koprowski H. Localization and immunological characterization of antigenic domains of the rabies virus internal N and NS proteins. Virus Res. 1987;8(2):103–125. Yang J, Koprowski H, Dietzschold B, Fu ZF. Phosphorylation of rabies virus nucleoprotein regulates viral RNA transcription and replication by modulating leader RNA encapsidation. J Virol. 1999;73(2):1661–1664. Wu X, Gong X, Foley HD, Schnell MJ, Fu ZF. Both viral transcription and replication are reduced when the rabies virus nucleoprotein is not phosphorylated. J Virol. 2002;76(9):4153–4161. Bridgen A, Elliott RM. Rescue of a segmented negative-strand RNA virus entirely from cloned complementary DNAs. Proc Natl Acad Sci U S A. 1996;93(26):15400–15404. Griffin DE. Measles virus. Fields Virology. 2001:1401–1441. Ravanel K, Castelle C, Defrance T, Wild TF, Charron D, Lotteau V, Rabourdin-Combe C. Measles virus nucleocapsid protein binds to FcgammaRII and inhibits human B cell antibody production. J Exp Med. 1997;186(2):269–278. Marie JC, Saltel F, Escola JM, Jurdic P, Wild TF, Horvat B. Cell surface delivery of the measles virus nucleoprotein: a viral strategy to induce immunosuppression. J Virol. 2004;78(21):11952–11961. Marie JC, Kehren J, Trescol-Biemont MC, et al. Mechanism of measles virus-induced suppression of inflammatory immune responses. Immunity. 2001;14(1):69–79. tenOever BR, Servant MJ, Grandvaux N, Lin R, Hiscott J. Recognition of the measles virus nucleocapsid as a mechanism of IRF-3 activation. J Virol. 2002;76(8):3659–3669. Sato H, Masuda M, Kanai M, Tsukiyama-Kohara K, Yoneda M, Kai C. Measles virus N protein inhibits host translation by binding to eIF3-p40. J Virol. 2007;81(21):11569–11576. Longhi S, Oglesbee M. Structural disorder within the measles virus nucleoprotein and phosphoprotein. Protein Pept Lett. 2010;17(8):961–978. Gombart AF, Hirano A, Wong TC. Nucleoprotein phosphorylated on both serine and threonine is preferentially assembled into the nucleocapsids of measles virus. Virus Res. 1995;37(1):63–73. Hagiwara K, Sato H, Inoue Y, et al. Phosphorylation of measles virus nucleoprotein upregulates the transcriptional activity of minigenomic RNA. Proteomics. 2008;8(9):1871–1879. Sugai A, Sato H, Yoneda M, Kai C. Phosphorylation of measles virus nucleoprotein affects viral growth by changing gene expression and genomic RNA stability. J Virol. 2013;87(21):11684–11692. Noe KH, Cenciarelli C, Moyer SA, Rota PA, Shin ML. Requirements for measles virus induction of RANTES chemokine in human astrocytoma-derived U373 cells. J Virol. 1999;73(4):3117–3124. Hutchinson EC, Denham EM, Thomas B, et al. Mapping the phosphoproteome of influenza A and B viruses by mass spectrometry. PLoS Pathog. 2012;8(11):e1002993. Turrell L, Lyall JW, Tiley LS, Fodor E, Vreede FT. The role and assembly mechanism of nucleoprotein in influenza A virus ribonucleoprotein complexes. Nat Commun. 2013;4:1591. Chan RW, Yuen KM, Yu WC, Ho CC, Nicholls JM, Peiris JS, Chan MC. Influenza H5N1 and H1N1 virus replication and innate immune responses in bronchial epithelial cells are influenced by the state of differentiation. PLoS One. 2010;5(1):e8713. Elton D, Medcalf E, Bishop K, Digard P. Oligomerization of the influenza virus nucleoprotein: identification of positive and negative sequence elements. Virology. 1999;260(1):190–200. Chenavas S, Estrozi LF, Slama-Schwok A, et al. Monomeric nucleoprotein of influenza A virus. PLoS Pathog. 2013;9(3):e1003275. Tarus B, Bakowiez O, Chenavas S, et al. Oligomerization paths of the nucleoprotein of influenza A virus. Biochimie. 2012;94(3):776–785. Ye Q, Krug RM, Tao YJ. The mechanism by which influenza A virus nucleoprotein forms oligomers and binds RNA. Nature. 2006;444(7122):1078–1082. Turrell L, Hutchinson EC, Vreede FT, Fodor E. Regulation of influenza A virus nucleoprotein oligomerization by phosphorylation. J Virol. 2015;89(2):1452–1455. Tao XH, Shen JG, Pan WL, Dong YE, Meng Q, Honn KV, Jin R. Significance of SHP-1 and SHP-2 expression in human papillomavirus infected Condyloma acuminatum and cervical cancer. Pathol Oncol Res. 2008;14(4):365–371. Bakken T, He M, Cannon ML. The phosphatase Shp2 is required for signaling by the Kaposi’s sarcoma-associated herpesvirus viral GPCR in primary endothelial cells. Virology. 2010;397(2):379–388. Zhao L, Xia J, Li T, et al. Shp2 deficiency impairs the inflammatory response against haemophilus influenzae by regulating macrophage polarization. J Infect Dis. 2016;214(4):625–633. Zhong L, Li B, Jayandharan G, et al. Tyrosine-phosphorylation of AAV2 vectors and its consequences on viral intracellular trafficking and transgene expression. Virology. 2008;381(2):194–202.